Do you ever have a dish where you think, actually I’d be quite happy just to eat one part of the dish on it’s own as it just tastes so mighty fine? For me the rice in this dish is the star. I never thought I would hear myself say that but it was just so fragrant and a welcome change to the normal and often insipid steamed rice. This is an adaptation from an Olive recipe and silly me, I didn’t have any Madras or Indian curry paste so I used Thai Sour Curry paste which worked well with the Coriander and Red Chilli to bring about an essence of Thai to the dish. I also swapped Basmati rice for a Lucky Thai rice. Another benefit of this dish is that you can eat it warm or cold and if you want to add more chicken you can replace the fillets with 2 chicken breasts. 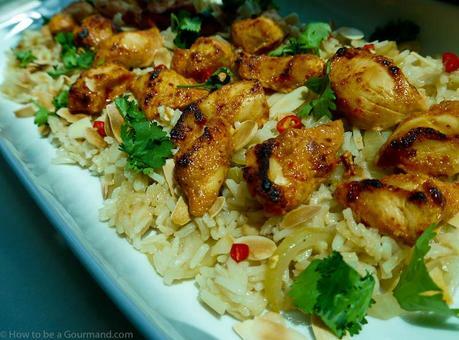 An easy recipe where the chicken marinade can be made the night before. Can be served warm or cold. Empty the contents of the yoghurt into a shallow dish and add the sour curry paste. Mix well until you have a smooth marinade. 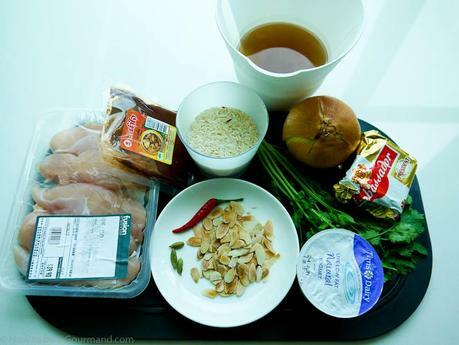 Place the chopped chicken into the marinade. Ensure the marinade has covered the chicken properly. Cover and refrigerate for 2 hours. Place the butter in a thick based pan with a lid. Add the sliced onion and cardamom pods and cook slowly over a low heat for about 15 minutes. This gives the onion a really nice texture in the rice. Add the rice and the stock. Bring to a simmer, cover with lid and cook until the rice is tender. Meanwhile, add the chicken pieces to a grill and remove when cooked through. A charcoal effect should be seen on the chicken. Remove the cardamom pods from the rice and serve onto a platter. Sprinkle on the chilli, coriander and flaked almonds. Place the chicken pieces on top of the bed of rice. 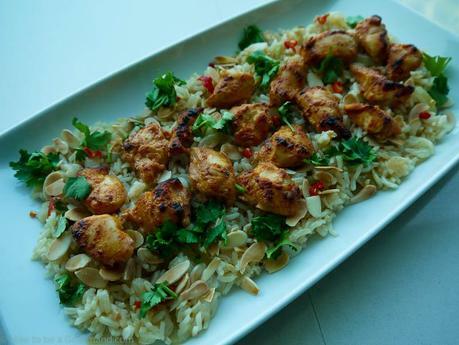 Schema/Recipe SEO Data Markup by ZipList Recipe Plugin2.0http://howtobeagourmand.com/yoghurt-spiced-chicken-with-almond-coriander-rice/Unless otherwise stated, text and photographs © 2011 How to be Gourmand. All Rights Reserved. Kindly request permission from the author to copy or reproduce elements of this blog. How would you make rice more interesting? Please let me know your ideas. I am keen to try! Like How to be a Gourmand on Facebook.